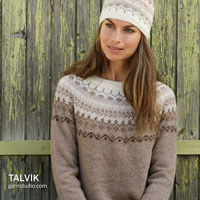 Go to original pattern for design DROPS Extra 0-1429. 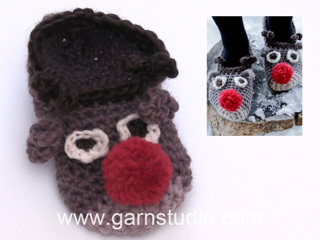 Crocheted slippers in DROPS Eskimo. 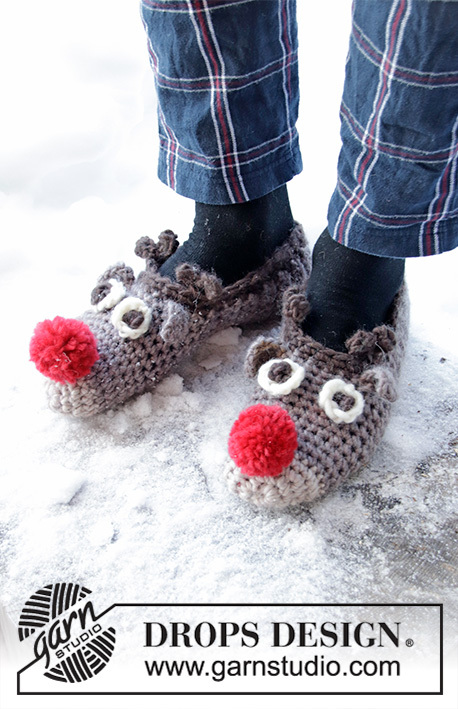 Slippers with reindeer heads and pom poms. Sizes 35 – 43. Theme: Christmas. Foot length: approx. 22 – 24 – 27 cm. 12 double crochets in width and 12 rows in height = 10 x 10 cm. The hook size is only a guide. If you have too many stitches on 10 cm, change to a larger hook size. 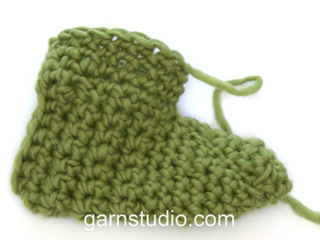 If you have too few stitches on 10 cm, change to a smaller hook size. At the beginning of each round/row of double crochets, replace the first double crochet with 1 chain stitch, i.e. skip the first stitch on the previous round/row. The round finishes with 1 slip stitch in the first chain stitch at the beginning of the round. Work 2 double crochets in same double crochet. 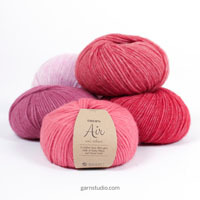 When changing colours at the beginning of a round, work the slip stitch at the end of the previous round with the new colour. The piece is worked in the round, from the toe to the instep, with ears. Then you work back and forth over the heel. You work an edge with antlers around the opening. 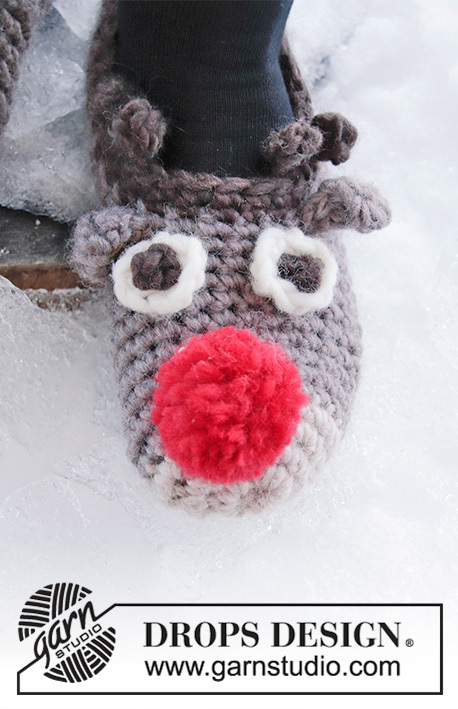 Eyes and nose are worked separately and fastened to the slipper to finish. Work 3 chain stitches with hook size 6 mm and light beige and form them into a ring with 1 slip stitch in the first chain stitch. Start of round = mid under foot. ROUND 1: Work 7-7-8 double crochets around the ring - read CROCHET INFORMATION! ROUND 2: Work 2 double crochets in each double crochet = 14-14-16 double crochets. ROUND 3: Work * 1 double crochet in the first double crochet, 2 double crochets in the next double crochet *, work from *-* to end of round = 21-21-24 double crochets. ROUND 4: Work 1 double crochet in each double crochet at the same time as you increase 3-3-4 double crochets evenly on round – read INCREASE TIP = 24-24-28 double crochets. ROUND 1 (round with ears): Work 1 double crochet in each of the first 9-9-11 double crochets. Work * 6 chain stitches, turn and work back in these chain stitches as follows: 1 half treble crochet in the 2nd chain stitch from the hook, 1 treble crochet in the next chain stitch, 1 double treble crochet in the next chain stitch, 1 treble crochet in the next chain stitch, 1 half treble crochet in the last chain stitch * (= ear). Work 1 double crochet in each of the next 6-6-6 double crochets (= mid top of foot), work from *-* 1 more time (= ear) and then work 1 double crochet in each of the last 9-9-11 double crochets. ROUND 2: Work 1 double crochet in each double crochet; make sure the ears lie to the front while you work. The piece now measures approx. 11-12-13 cm. Now divide the piece and work back and forth with tan. Start working in the 16th-16th-18th double crochet from the beginning of the round (i.e. the beginning of the round is now on the side of the foot). Work 1 double crochet in each of the next 18-18-22 double crochets (= 6 double crochets mid top of foot are not worked). Work back and forth with 1 double crochet in each double crochet until the piece measures 22-24-27 cm. Fold the slipper and lay flat; crochet together mid back with a row of double crochets through both layers from the wrong side. Cut and fasten the strand. 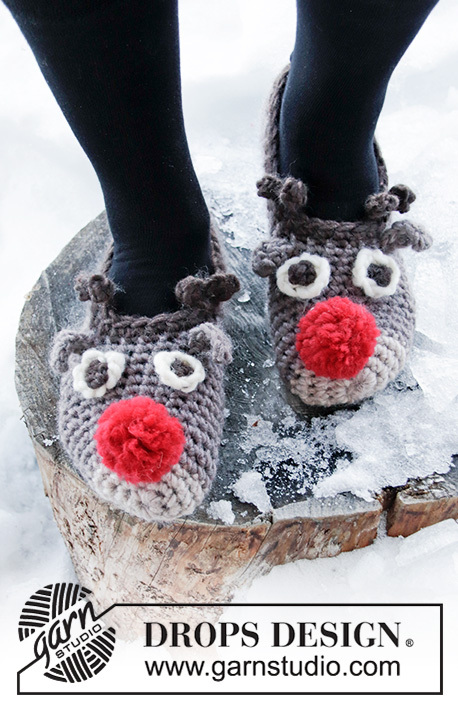 Work an edge around the opening of the slipper with dark brown, at the same time as you work antlers on round 2. ROUND 1: Start mid back of heel and work the next round as follows: Work 10-11-14 double crochets evenly spaced on the rows on the first side, 1 double crochet in each of the 6 double crochets mid front, 10-11-14 double crochets evenly spaced on the rows on the next side = 26-28-34 double crochets on the round. ROUND 2 (round with antlers): Work 1 double crochet in each of the first 10-11-14 double crochets. Work * 4 chain stitches, turn and work back over these chain stitches as follows: 1 double crochet and 1 half treble crochet in the 2nd chain stitch from the hook, 1 slip stitch in the next chain stitch, 3 chain stitches, 1 double crochet and 1 half treble crochet in the 2nd chain stitch from the hook, 1 slip stitch in the next chain stitch and work 1 slip stitch in the last of the 4 chain stitches * (= antler). Work 1 double crochet in each of the next 6-6-6 double crochets (mid top of foot), work from *-* 1 more time (= antler) and then work 1 double crochet in each of the last 10-11-14 double crochets. Cut and fasten the strand. Work 3 chain stitches with hook size 6 mm and dark brown (leave a strand end of approx.10 cm for use in assembly), 1 treble crochet in the first chain stitch worked, change to off white and work 4 chain stitches, 1 slip stitch in the chain stitch at the bottom of the treble crochet, work 4 chain stitches and finish with 1 slip stitch in the first chain stitch worked with off white. Cut the strand (leave a strand end of approx.10 cm for use in assembly). Fasten the strands which will not be used in assembly. Work 1 more eye. 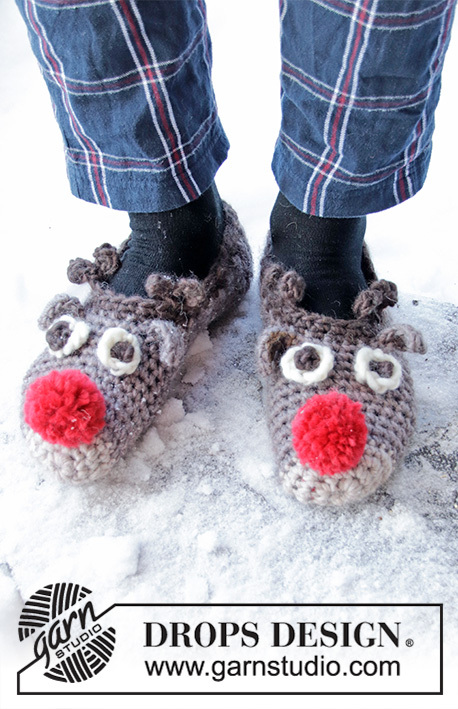 Fasten the eyes to the front of the slipper – place them so that there are 2 rounds of tan over the eyes and approx. 1 cm between each eye. 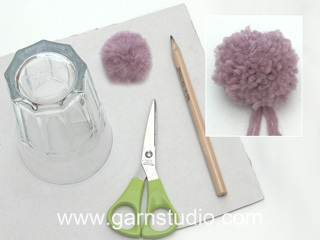 Make a pom pom with red, of approx. 5 cm in diameter and fasten it mid front of slipper – place it between the rounds of light beige and tan. 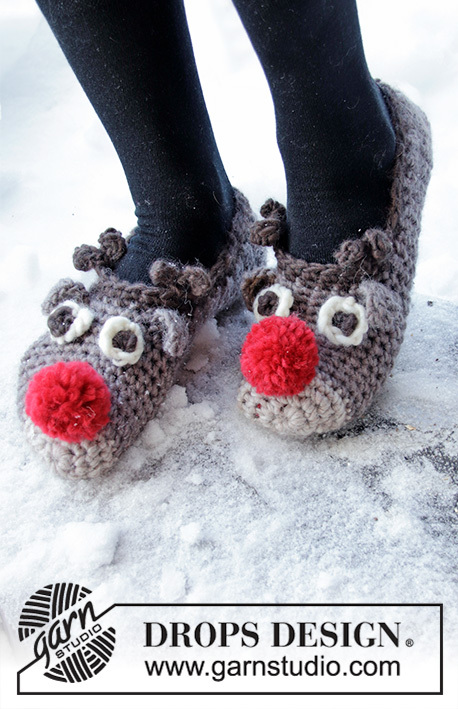 Work the other slipper in the same way. Is it possible to download these patterns? Easier than keep looking on screen! Dear Sue, our patterns can only be printed, but using a virtual printer can let you save them as a .PDF file. Happy crocheting!